Superheroes are hampered by two things: they were first thought up as wholesome entertainment for children, and their adventures have no defined end point. So writers can’t afford to kill off a good villain without losing a crucial source of conflict. Which is always their biggest mistake. Take last night’s episode of Arrow—spoilers ahead! We can all agree that John Barrowman is the human equivalent of moonlight glinting off the haunches of a magnificent white stallion. But his character has been actively murdering innocent people, sometimes hundreds at a time, for eight years. Often those people are Oliver Queen’s family and friends. Killing Malcolm should have been priority number one the moment they found out he was still alive. 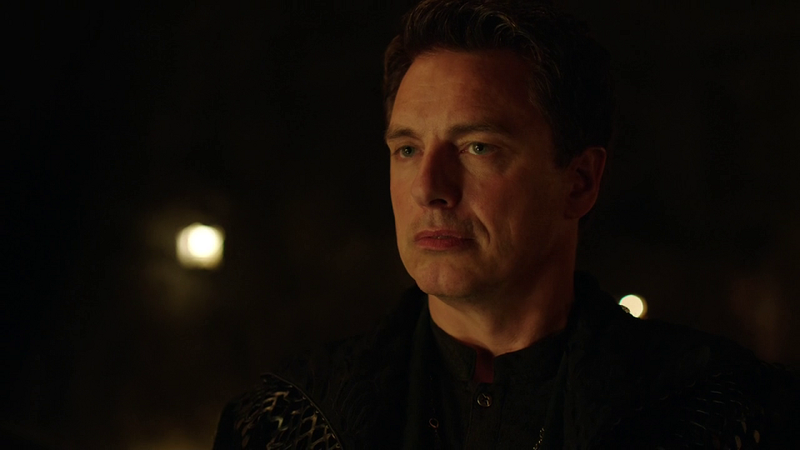 Nyssa’s demand that Ollie kill Merlyn to save Thea was the perfect excuse to do what should have been done years ago. Okay, awesome, but it means that Malcolm, the furiously angry sociopath, goes running directly to Darhk and tells him about Ollie’s secret Canadian, I mean Central City, family. Which gives us a good idea of who is in the grave we saw, way back in the first episode.